Expansion to the further education sector is continuing to grow and this relatively small college in Nuneaton was bursting at the seams with its popularity and courses. Initially the proposal comprised of a meeting place for students, then an extension to the library, followed by the realised project of an office with adjacent teaching spaces. block both of which are mentioned in Pevsner’s ‘The Buildings of England: Warwickshire’ series. time of this project. Therefore reclamation and recycling was very high in the priority of the designed structure. A steel frame with timber framing and cedar cladding were all chosen for their potential reuse along with their inherent design characteristics. 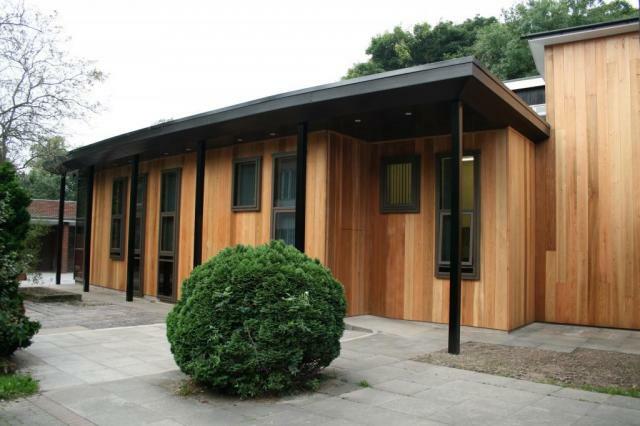 The proposal used tall window elements from some of the windows within the listed building and timber cladding to echo that of the science block. The project was completed in a very short period of time through the summer recess and was commended by the local authority conservation architect upon completion.